Krzysztof Dobrek grew up on the edge of the greatest expanse of sand in central Europe –the Bledowska-desert in Poland. At the age of seven he began to take accordion lessons. At thirteen he left his home and accordion and moved to Krakow to become a bassoon player in the world of classical music and jazz. One day, on his way to the conservatory he listened to a Gypsy band, which completely changed his understanding of music. 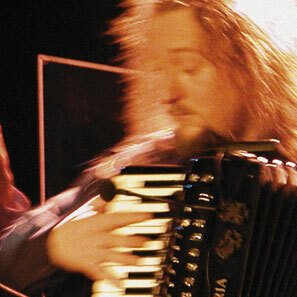 In 1990 Dobrek emigrated to Vienna where he again started playing the accordion after a ten year hiatus. For years Dobrek went through the tough school of street music –one he values higher than his academic education. Afterward, he was engaged on the spot as instrumentalist-in-chief by the Steyrian Folk/Cabaret-band “Die Landstreich”. What followed were projects at the Theater an der Wien, Theater in der Josefstadt and the Burgtheater. He played with the Acoustic Drive Orchestra and the Tschuschenkapelle and is Maria Bill’s Edith-Piaf and Jacques-Brel Revue accordionist. Dobrek’s compositions are interpreted by well-known ensembles such as Mnozil Brass, Triology and the Wiener Concert Schrammeln.